On the heels of its announcement of plans to monitor global oil and natural gas methane emissions from space, the Environmental Defense Fund (EDF) released a new report last week that calls for companies to either reduce methane emissions 75 percent from current levels, or to 0.2 percent of production. But it is with the latter claim that some important context is in order, notably the fact that not all methane mitigation opportunities are equal — a fact that the International Energy Agency (IEA) report which the EDF report’s global emissions data was pulled from fully concedes. 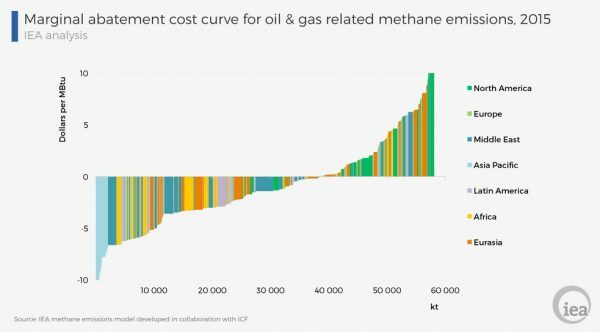 The IEA’s 2018 World Energy Outlook states that, “The cost of (methane) mitigation is generally lowest in developing countries in Asia, Africa and the Middle East.” And as the following graphic from the IEA report illustrates, mitigation costs are highest in North America. The final version of the EPA Greenhouse Gas Inventory show U.S. oil and natural gas methane emissions have fallen 14 percent since 1990 at the same time that oil and natural gas production has increased 50 and 21 percent, respectively. 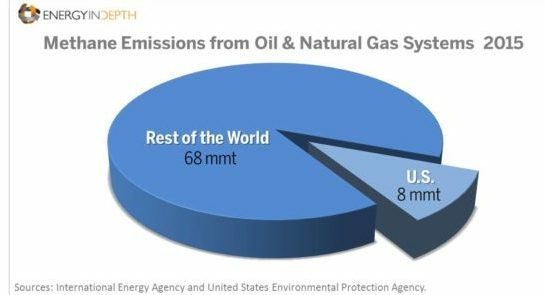 U.S. oil and natural gas system methane emissions have decreased 32.8 million metric tons (mmt) CO2 equivalent over the past 28 years, representing more than a quarter of the 123 mmt CO2 eq. overall anthropogenic methane emission declines the country has achieved. It is thanks to companies’ continued focus on voluntarily reducing methane emissions that U.S. oil and natural gas methane emissions represent just 10.4 percent of global oil and natural gas emissions despite America’s status as the world’s top oil and gas producer. The Global Carbon Project’s Methane Budget — which was cited in the recent National Academy of Sciences report featuring recommendations to improve methane measuring and inventories — also shows that U.S. oil and natural gas system methane emissions represent just 1.4 percent of overall global methane emissions. All this noted, low-cost mitigation measures have been more extensively utilized in the U.S. when compared to the rest of the world, as the above IEA chart illustrates. Put another way, the lowest hanging fruit on the potential methane reduction front exist outside the U.S.
Further illustrating this fact is the EDF report’s finding that 34 mmt of the total of 75 mmt of global oil and gas methane emissions are attributable to upstream oil production. The report even states that, “… Data indicates that roughly half of industry’s upstream methane problem stems from oil development,” a scenario most would probably expect to be the other way around, considering natural gas development is most commonly associated with methane emissions. The latest GHGI data show that U.S. oil production emissions (1.4 mmt) make up just four percent of the world total, even though this U.S. is on the verge of surpassing Russia and Saudi Arabia on the global leaderboard for crude oil production. The EDF report argues that, “The oil and gas industry cannot credibly position natural gas as a climate solution while emitting large amounts of methane from oil-heavy fields.” That may be true for the world as a whole, but not for the United States. America is the world’s leader in carbon dioxide reductions thanks largely to natural gas, and the issue of methane emissions from upstream oil development is clearly one that the United States has a better handle on than its international counterparts. Add in low leakage rates from natural gas systems (according to EDF’s own studies) and climate benefits of developing natural gas resources via shale development couldn’t be more evident in the U.S.
To be clear, reducing emissions as much as possible makes all the sense in the world from both an environmental and economic standpoint. And EDF’s report rightly credits companies such as Apache, Statoil, Southwestern, Noble Energy, ConocoPhillips, Hess, ExxonMobil and Shell for either setting specific reduction targets or voluntarily pledging to reduce emissions. However, this report is seriously lacking in perspective on an issue that the U.S. oil and gas industry is already making great strides on, and all signs point to America continuing to lead the way on the methane mitigation front moving forward.